Any time I can learn something about myself is a good time! It helps me become more aware of life around me, and how I deal with it. On our recent holiday to France I realized how much of my life is routine and how that affects me. When we are at home, I like routine. And not just the daily routine I have developed, but the weekly routine I am used to. I am not inflexible and will do things on the spur of the moment, but disrupting my routine is not something I choose to do. When we are overseas, I have no routine. I just go with the flow and do what ever Dave has chosen for that day. I don’t do the cooking while we are away from home so there are no choices for me to make. I can make suggestions, but the cooking is Dave’s domain. This holiday our plans were disrupted and Dave was the one whose sense of routine was affected. He likes to know where we are going and what we are doing every day while we are overseas. He took a morning to sort out travel arrangements and one day was spent driving with only a few stops. It was only after this that Dave finally relaxed and we could spend time taking it slow, not being in a rush and playing tourist. Our holiday was quite exhausting for a lot of reasons and we got home in time for a late lunch after being in airports or in planes for nearly 24 hours. Thankfully a bowl of soup was the perfect meal, and had I had more of this Jerusalem Artichoke Soup that would have been my first choice. It is silky smooth and the perfect lunch time meal. I love them and put in a soup sounds perfect. I’ve never cooked with these intriguing little tubers – don’t see them here for some reason. Would love to try your soup. Lovely easy recipe with a fabulous result. I agree, it’s wonderful to learn new things about yourself. I think people that travel are often really well balanced and see perspective well too! your artichoke soup sure taste comforting! Wow how easy is that, a 3 ingredient recipe. I will have to give this a try. My husband loves artichokes and this is a great low carb recipe too. The soup sounds and looks delicious….simple are the best. Hi Tandy, I have never cooked with or tasted Jerusalem artichokes before, looking forward to trying this recipe, looks delicious! My husband usually plans all of our trips as well, makes it easy for me. This sounds so simple yet delicious! Delicious and simple, I love it! I’m a huge artichoke fan and would love to make this soup! Creamy and delicious, sometimes soup feels like the ONLY lunch option. Love how Dave made the arrangements on your trip (did the planning) On trips, I’m typically am the planner but get so burned out! And I too, love routine. Hi, Tandy! If I were you I’d try to go on a few more holidays – it sounds great to have a total break and let hubby make all the arrangements! I love this soup because it’s so so easy but ends up looking beautifully creamy. This is definitely one to try! Helen, I am so with you there, more holidays are in order! Such a simple and nourishing soup to welcome you home. I’m a girl of routine as well, except when I’m traveling. 🙂 I wonder why that is? A great way to use this vegetable and you recipe is so easy – thanks Tandy. The simplest of soups are usually the most comforting! Warm and tasty, I won’t say no this! Thanks, Tandy! 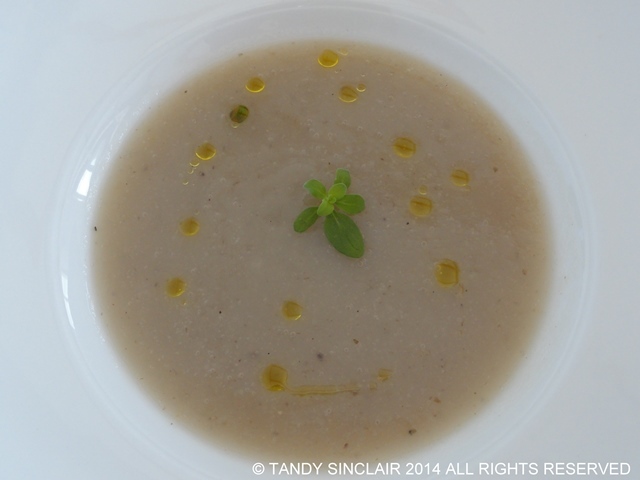 I have never cooked much with Jerusalem artichokes, but I think this soup is a must-try!